Unfortunately, I wrote this review after having to return the boots to shop. I don't use them anymore and would definitely not recommend buying them. Earlier this year I was looking for a good hiking shoes. Since I hike a lot in the mountains I am a bit fussy about the boots. They need to be solid, waterproof, comfortable, light and with thick sole. Not a single pebble should be felt while wearing them. The boots should cope well with mud and take proper care of my feet even when hiking all day in deep snow. And Verbera Hiker II GTX didn’t. Before buying them I thought: “The North Face – is there better sportswear company in the market? They do brilliant jackets, so the boots should be good too”. And off I went to the nearest TNF shop in Katowice. Verbera Hiker II GTX boots weren’t particularly cheap – they costed 600 PLN (about 150 USD) but I was sure they still were a good value for money. To be honest, I need to admit their first try-out wasn’t an easy one. 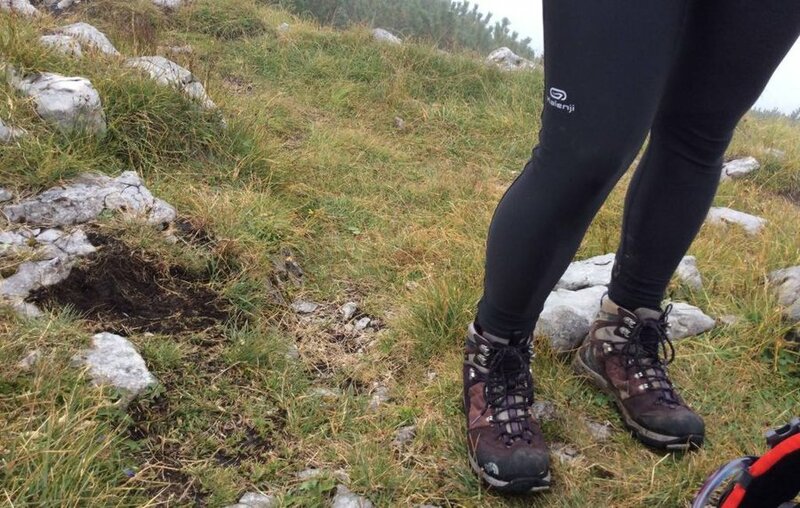 I wore them while hiking to Chopok (2024 metres - the third highest peak of Low Tatra range in central Slovakia). It was late February and the snow was reaching hips level at some points. After a couple of hours I felt my feet were cold and wet – such a “nice” hiking experience. I told my friends whom I was hiking with that I felt humidity in my shoes, but they convinced me that my boots were surely fine and I shouldn’t worry – it was my feet that were sweating and I felt cold simply because... it was cold. “It’s The North Face – it has to be good. You’re nitpicking, that’s what you're doing”. Apparently I had a dead-brain-moment at that time and believed them. So I continued using these boots for the next several months. And I wasn’t entirely satisfied with them. They were light and the sole was all right but my feet were getting humid at wet weather and, to make matters worse, the rubber parts in front of the shoes started to unglue ! On both boots! After a few months! I might have been hiking quite a lot, but, on the other hand, I didn’t go on a 2-week expedition to the Andes! So, I wasn't content with the boots, but it was the last straw when they let in water while I was hiking in Austrian Alps. I was walking in high wet grass and my feet started swimming . I got the boots off and saw my socks were entirely wet! Very unpleasant experience. At that point I decided it was high time to return them (which, by the way, I should have done long before). However, there's some positive stuff about TNF that I would like to mention. It’s their fantastic customer service . They might not have made the best hiking boots this time but they do care about the customer. Firstly, they ordered for me smaller size when it turned out that they didn’t have my size in stock. And the delivery was super fast . Secondly, the return of faulty goods went really smooth – I didn’t have to fight for my rights, no discussions, no begging, no nothing. I just filled up a paper and after 2 weeks I got my money back, straight on my bank account. Isn’t that wonderful? I don't think I've ever experienced such problem-free complaint process . In addition, the staff was very polite and attentive which, unfortunately, isn’t that common in Poland (yet). Rubber elements in front of the shoes unglued after about 3 months of moderate to intensive using. If you feel I left out some useful information about the boots, feel free to comment below or contact me directly here .